This was our first solo adventure into London. It took two trains and a bus to get us there, which made it even more exciting. We got the bus from Liverpool Street to Westminster, which took us right past all of the famous landmarks like St Paul's Cathedral and Trafalgar Square. 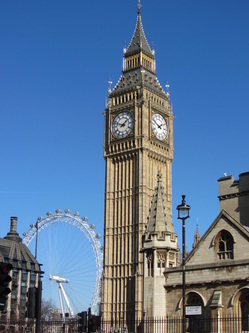 We had a good look around Westminster, but didn't go in anywhere yet, and she was really chuffed to see Big Ben. I made sure we could watch as it chimed the hour. We talked about the Houses of Parliament and Downing Street, and watched the London Eye turning. 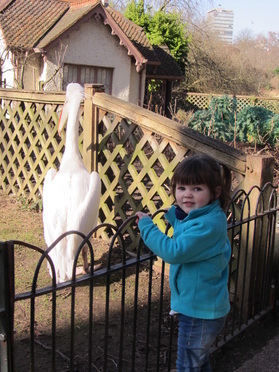 We then walked to St James' Park, behind the back of Downing Street and into the entrance by the pelicans. We stopped to have a picnic on the grass, and then walked around the park. We then walked up to Buckingham Palace and waved to the Queen. I had planned on continuing to a Museum, but all the walking made Amelia fall asleep before we could get there.